Home / Case Study / FROM THE FIELD: Banker Jr. talks financial education with Chemical Bank. HT Mobile Apps chatted about Banker Jr. with Donny Hefner, Marketing Communications Coordinator at Chemical Bank, Midland, Michigan. When did you launch Banker Jr.? Michigan Bankers Association (MBA) Bankers Education Summit and Trade Show (BEST). We were so excited about what Banker Jr. could offer and knew it would complement our current youth focused financial literacy efforts. Looks like you’ve got a robust financial literacy program already, why did you choose Banker Jr? Banker Jr. gives us an app that we can use to reach more children via an electronic platform. They can learn at home, in the car, on an iPhone, iPad or Android. With Banker Jr, we can teach more kids about good financial stewardship in a ways that they enjoy. Chemical Bank recently included Banker Jr in its efforts around Teach Children To Save Day in April. How did that go? Since 2008, Chemical Bank has made presentations in second grade classrooms across Michigan. This year we taught basic financial education to over 5,400 students. This year, we promoted our free Chemical Banker Jr. App for iPhone, iPad and Android devices! This year’s Teach Children to Save student packets showcased the Banker Jr. logo on the outside cover and within the activity booklet. Several pieces within the packet also included the Banker Jr. logo, along with directions on where to download the app. You seem pretty passionate about Banker Jr. as a strong financial literacy tool. Yes we are! 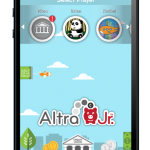 Banker Jr. is an innovative, fun and safe app that lets kids do what they like to do—play games (while teaching them valuable financial skills). It fits perfectly into our mix of financial education resources because it provides digital tool for children. How does Banker Jr. fit in with your other marketing efforts? Right now, Banker Jr, is enjoying a “front-and-center” appearance in our financial literacy efforts. It’s featured on the home page of our website and is currently our lead initiative when we talk about our financial education efforts. Do you have any advice for other financial institutions considering Banker Jr.? Chemical Financial Corporation is the second largest bank holding company headquartered in Michigan. The Corporation operates through its subsidiary banks, Chemical Bank and Monarch Community Bank (effective April 1, 2015); with 183 banking offices spread over 47 counties in Michigan. At March 31, 2015, the Corporation had total assets of 7.6 billion. Chemical Financial Corporation common stock trades on The NASDAQ Stock Market under the symbol CHFC and is one of the issues comprising the NASDAQ Global Select Market. Member FDIC. Equal Housing Lender.